The One Hundredth United States Congress was a meeting of the legislative branch of the United States federal government, composed of the United States Senate and the United States House of Representatives. It met in Washington, D.C. from January 3, 1987, to January 3, 1989, during the last two years of Ronald Reagan's presidency. The apportionment of seats in the House of Representatives was based on the Twentieth Census of the United States in 1980. Both chambers had a Democratic majority. President Reagan signed the Civil Liberties Act of 1988 into law, August 10, 1988. Senators are popularly elected statewide every two years, with one-third beginning new six-year terms with each Congress, In this Congress, Class 1 meant their term ended with this Congress, facing re-election in 1988; Class 2 meant their term began in the last Congress, facing re-election in 1990; and Class 3 meant their term began in this Congress, facing re-election in 1992. (1) Edward Zorinsky (D) Died March 6, 1987. (1) David Karnes (R) Lost election and resigned November 8, 1988. Vacant to the end of this Congress. Secretary for the Minority: Howard O. Greene, Jr.
"Videos of House of Representatives Sessions for the 100th Congress from www.C-SPAN.org". "Videos of Senate Sessions for the 100th Congress from www.C-SPAN.org". 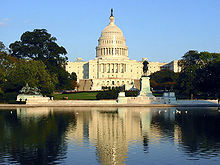 "Videos of Committees from the House and Senate for the 100th Congress from www.C-SPAN.org". House of Representatives Session Calendar for the 100th Congress (PDF). Congressional Pictorial Directory for the 100th Congress. Official Congressional Directory for the 100th Congress.